Occur in San Diego County? 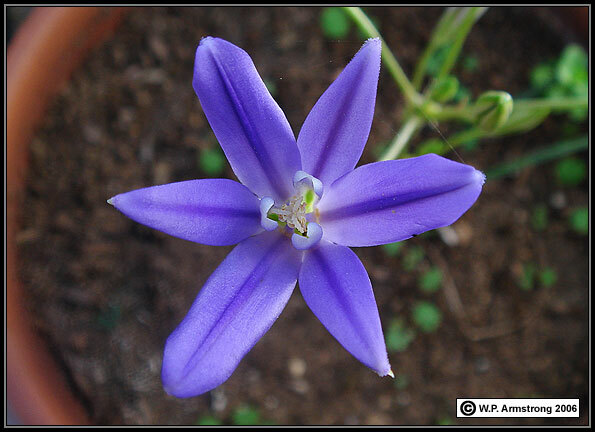 "Brodiaea terrestris ssp. kernensis" as "Montane BTK." 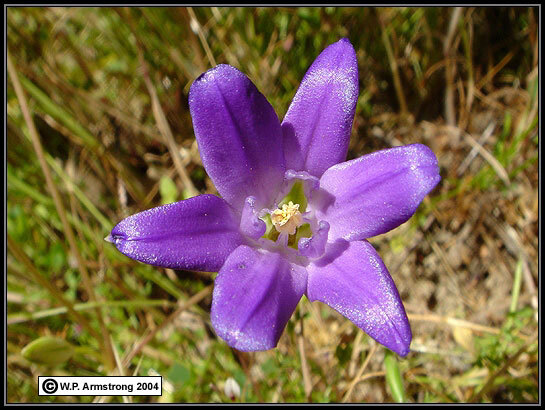 Interesting Brodiaea: It is listed under B. jolonensis in Jepson Manual (2012) as possible "undescribed taxon." It appears different from B. jolonensis in Monterey County (Fort Hunter Liggett Army Base). Is this a new taxon in the process of evolving? Perhaps DNA analysis will solve this taxonomic dilemma. 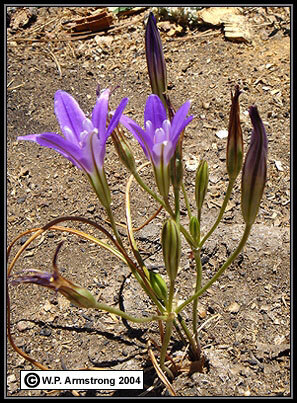 See Does Brodiaea jolonensis Occur in San Diego County? Abstract: Coastal populations of Brodiaea in San Diego County with prominent hooded staminodes (with incurved apex) have been previously called B. jolonensis. Using the Jepson Manual (1996) which is based on A Biosystematic Study of the Genus Brodiaea (Amaryllidaceae) by T.F. Niehaus (1971), they key out to B. terrestris ssp. kernensis. This species has a green ovary, unlike the purple ovary of B. jolonensis. The term "dentate connective" used in the Jepson key ideally applies to B. terrestris ssp. terrestris of central and northern California. In this subspecies, the apex of the anther connective extends into a prominent dentate lobe. In southern California populations of Coastal BTK and Montane BTK, the connective apex has a U-shaped or V-shaped notch. At the base of this notch there may be a minute, dentate lobe, although it is absent in most southern California populations. With a dentate appendage at the base, the notch appears W-shaped. B. jolonensis also has a V-shaped notch without a dentate appendage. These subtle differences are difficult to observe in pressed herbarium specimens. 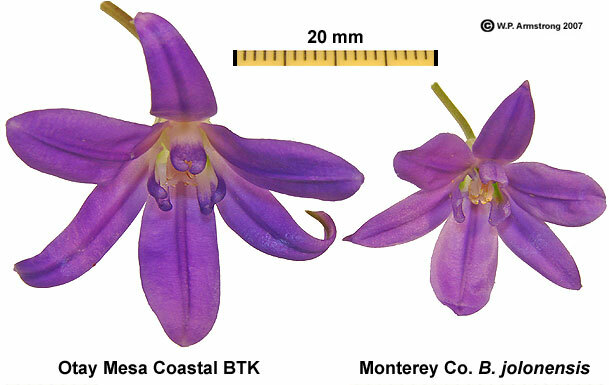 Floral dimensions of Coastal BTK and Montane BTK are significantly larger than populations of B. jolonensis in Monterey County, and the scapes are generally shorter. In addition, vascular strand patterns of the inner perianth match those of B. terrestris kernensis. Populations of Coastal BTK throughout San Diego County generally have staminodes that are incurved at the apex (hooded), while populations of Montane BTK generally have erect staminodes that are inrolled along the upper margins, but not hooded or slightly hooded. Both Munz (A Flora of Southern California, 1974) and Beauchamp (A Flora of San Diego County, California, 1986) recognized a difference between the coastal and mountain populations. These authors called the mountain populations B. terrestris ssp. kernensis and the coastal populations "B. jolonensis." Brodiaeas resembling both the coastal and montane forms of BTK grow together on the Santa Rosa Plateau of Riverside County. There is also staminode variation at Cuyamaca Lake in San Diego County. In addition Montane BTK from the Laguna Mts. grown in Escondido had hooded staminodes resembling those of Coastal BTK. Perhaps this is a single variable species in southern California. This is an ongoing research project with Tom Chester to understand the Brodiaea populations in southern California. W.P. Armstrong, May 2005. I have attempted to match their true color; however, they may appear different on your monitor. Introduction: Brodiaea jolonensis in Southern California? Comparison Of Traits In Brodiaeas of S. & Central Calif. Conclusion: Does B. jolonensis Occur in So. California? 1. 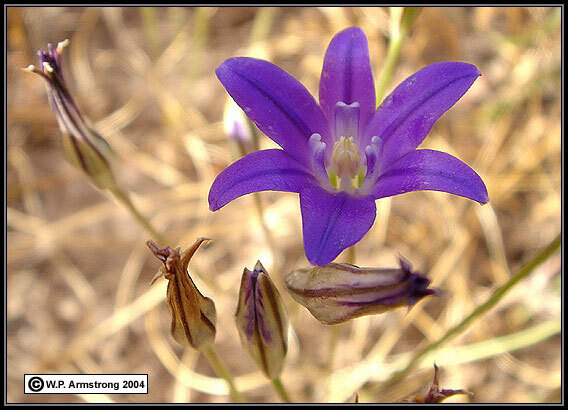 Introduction: Does Brodiaea jolonensis Occur In Southern California? When I first began studying brodiaeas in a field near Palomar College in San Marcos, I was convinced that three native species of Brodiaea were present: B. orcuttii with no staminodia, B. filifolia with filiform staminodia, and B. jolonensis with petaloid staminodia. A fourth brodiaea with strap-shaped staminodia appeared to be a hybrid between B. filifolia and B. jolonensis, or a variant in the population. In May 2003, Tom Chester suggested that the species identified as B. jolonensis might actually be B. terrestris ssp. kernensis, a species listed for the higher mountains of San Diego County, but not the coastal region. These two species are separated by filament length in A Flora of Southern California by P.A. Munz (1974). The filaments of B. jolonensis are 1 mm long, while those of B. terrestris ssp. kernensis are 2-5 mm long. Niehaus (1971) gives overlapping values of 1-2 mm for B. jolonensis and 2-3 mm for B. terrestris ssp. kernensis. We are now referring to the coastal species previously called B. jolonensis as Coastal BTK. These two species are separated in The Jepson Manual by the ovary color and whether the anther axis (anther connective) is dentate or entire. According to T.F. 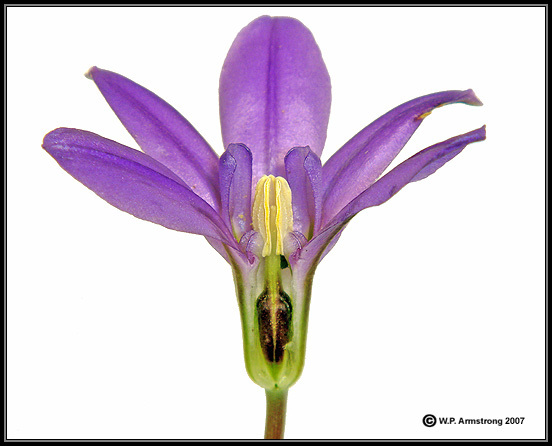 Niehaus, "A Biosystematic Study of the Genus Brodiaea (Amaryllidaceae)," Univ. of Calif. Publications in Botany Vol. 60 (1971), the ovary of B. jolonensis is light purple and the V-shaped apical notch in the anther axis is entire. According to Niehaus (1971), B. jolonensis is the only California species with a purple ovary. All of the brodiaeas in question have green ovaries, although some have faint streaks of purple. The apex of the anther axis (connective) has a U-shaped or V-shaped apical notch that is entire (as in B. jolonensis) or with a minute appendage or lobe at the base of the notch. The term "dentate anther connective" is more clearly evident in B. terrestris ssp. terrestris of central California and does not appear to be a reliable trait in the southern California populations referred to as Coastal BTK and Montane BTK. In fact, ssp. terrestris does not have the prominent V-shaped notch found in B. jolonensis and southern California populations of BTK. As Tom Chester and I accumulate more data from populations listed as B. jolonensis in southern California, it is becoming increasingly evident to us that these populations are in fact Coastal BTK. In fact, as we examine more populations, the differences between Coastal BTK and Montane BTK are becoming less distinct. The staminodes of coastal populations are generally hooded, while staminodes of mountain populations are generally inrolled along the margins and unhooded; however, there is substantial variability in staminodes, particularly at Cuyamaca Lake in San Diego County and the Santa Rosa Plateau of Riverside County. Until we understand their taxonomic relationship with the true ssp. kernensis of Kern and Tulare Counties, we are calling the southern California populations Coastal BTK and Montane BTK. Coastal BTK with white staminodia. In some members of the San Marcos population the staminodia are white, while in others the staminodia are purple. The apex of each staminode is curved inwardly (hooded) as in other populations of Coastal BTK in San Diego County. Flowers of Coastal BTK with white staminodes are also common above Gaviota Pass in Santa Barbara County. Montane BTK at Cuyamaca Lake with hooded staminodes. The shape of these staminodes appear virtually indistinguishable from Coastal BTK in San Marcos (previous image). Montane BTK from the Laguna Mountains (A) and Cuyamaca Lake (B) compared with Coastal BTK from Otay Mesa (C). All flowers came from plants grown in San Marcos (June 2007) from corms collected in their natural habitats. The flowers are strikingly similar in appearance and size. The perianth of all three flowers is about 32 mm in length. The staminodes of A and C are hooded at the apex. Staminodes of B are inrolled and slightly recurved at the apex. Numerous references have incorrectly referred to populations on the Otay Plateau and elsewhere in coastal southern California as B. jolonensis. 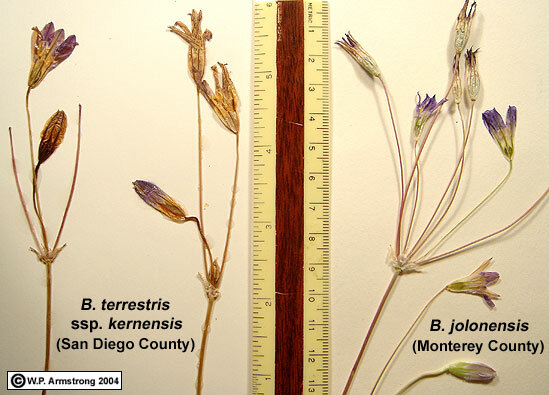 Coastal BTK from Otay Mesa compared with Brodiaea jolonensis from Monterey County. Both flowers came from plants grown in San Marcos (June 2007) from corms collected in their natural habitats. The perianth of Coastal BTK has a length of 32 mm and a spread of 35 mm, clearly as large as Montane BTK in San Diego County. The perianth of B. jolonensis has a length of 21 mm and a spread of 26 mm, roughly 30% smaller than the Coastal BTK. Flower dimensions of B. jolonensis are significantly smaller than B. terrestris ssp. kernensis and southern California populations of Coastal BTK and Montane BTK. The larger size of B. terrestris ssp. kernensis in Kern and Tulare Counties may be attributed to its octoploid sporophyte number (8n=48). The sporophyte number for diploid B. jolonensis is 2n=12. A reported hexaploid B. jolonensis (6n=36) from Otay Mesa (Niehaus #662) appears to be Coastal BTK based on the vascular pattern of its inner perianth segments. In addition, we have been unable to find any B. jolonensis in San Diego County. Chromosome studies of a clonal population with strap-shaped staminodes in San Marcos indicate that this brodiaea may be a hexaploid variant of BTK or possibly an interspecific hybrid. 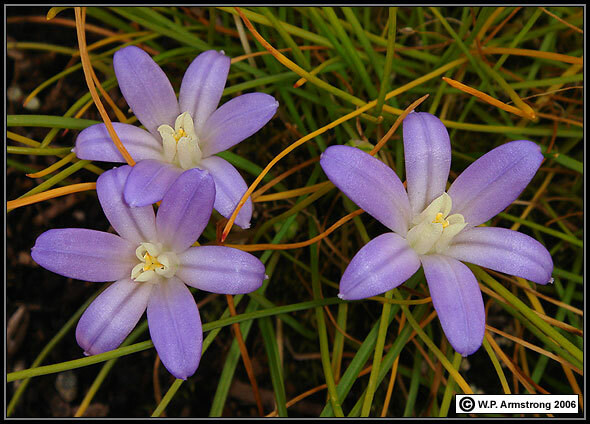 Quantitative differences between these two species are summarized by Tom Chester in "Brodiaea jolonensis Does Not Exist In Southern California." 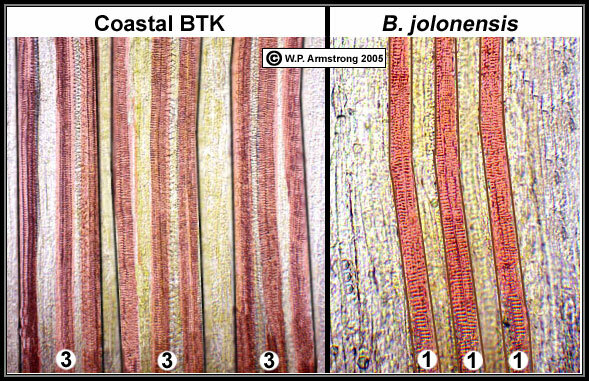 The scapes of Coastal BTK and Montane BTK are generally shorter than B. jolonensis. In fact, B. terrestris ssp. 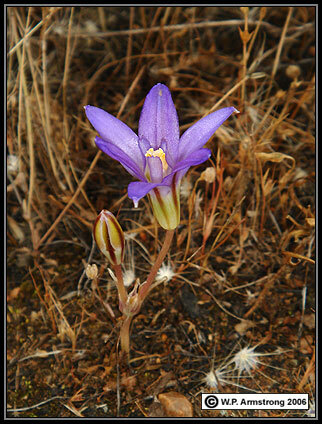 terrestris is called dwarf brodiaea or "earth brodiaea" because its inflorescences are close to the earth. The fresh ovary of BTK is green, while B. jolonensis has a conspicuously purple ovary. Although BTK sometimes has streaks of light purple, ovary color is a convenient trait to separate these two species in the field. Ovary color in herbarium specimens is useless because ovaries of most species darken when they dry. Some flowers of Coastal BTK have a minute dentate lobe at the base of the apical notch in the anther connective. Although it is not evident in all flowers of BTK, this trait is lacking in B. jolonensis. Finally, BTK has a very different vascular pattern in the inner perianth segments. The vein is composed of three or four distinct vascular strands, while Coastal BTK has up to nine vascular trands. This feature can readily be observed when the segments have been cleared in NaOH. The increased vascularization of BTK is undoubtedly related to its larger size. In addition, the outer bracts subtending the inflorescence generally have 5-8 nerves in BTK and 9-10 nerves in B. jolonensis. All of the above characteristics are illustrated in the following paragraphs. 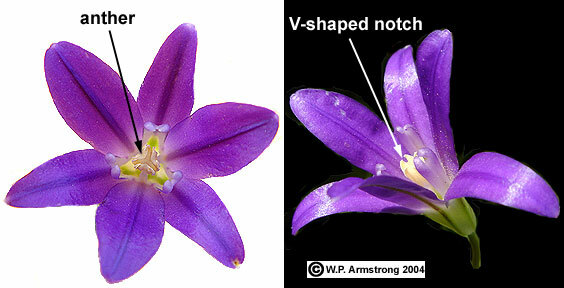 Theodore F. Niehaus has a generalized illustration of the dentate connective of "earth brodiaea" (B. terrestris ssp. terrestris) at the bottom of page 257 in A Field Guide to Pacific States Wildflowers (1976). 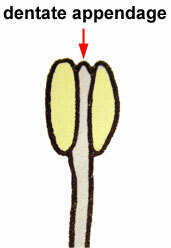 For "earth brodiaea" there is an exaggerated appendage extending above the connective (anther axis) between the two anther sacs. It superficially resembles a dentate extension of the filament above the anther. It is formed by a proliferation (elongation) of the anther connective tissue. This subspecies does not have a conspicuous U-shaped or V-shaped notch at the apex of the connective. In southern California populations of ssp. "kernensis", referred to as Coastal BTK and Montane BTK in this report, there is a U-shaped or V-shaped notch in the top of the anther connective. Some flowers have a minute dentate lobe at the base of this apical notch; however, in most populations the apical notch is entire (without a dentate lobe). 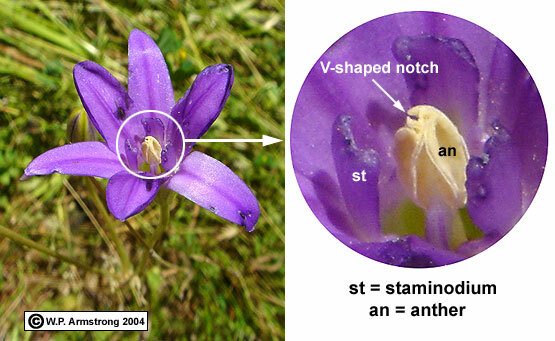 In "Jolon brodiaea" (B. jolonensis) of Monterey County, the V-shaped notch in the anther connective is also entire (without a dentate lobe). The term "dentate connective" or "dentate appendage" appears to be more applicable to populations of B. terrestris ssp. terrestris and ssp. kernensis in central California. This characteristic is of limited value in separating southern California populations of Coastal BTK and Montane BTK from B. jolonensis in Monterey County. Subspecies terrestris (left) has the true, prominent dentate anther connective (anther axis). In this subspecies the anther axis proliferates into a distinct dentate (toothed) appendage between the anther sacs. In southern California populations of Coastal BTK and Montane BTK the apex of the connective has a U-shaped or V-shaped notch. At the base of the notch in Coastal BTK there may be a minute dentate lobe; however, in most flowers this notch is entire (without a lobe). B. jolonensis also has an entire V-shaped notch. 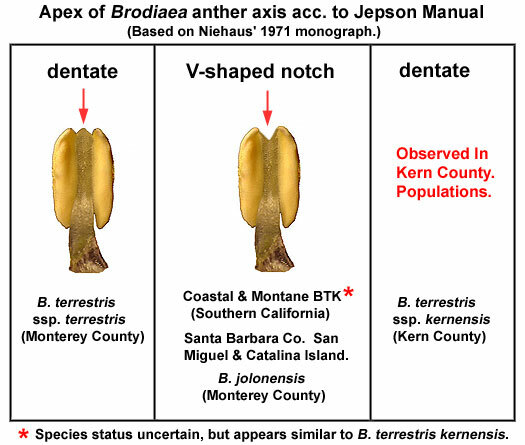 The term dentate anther connective or dentate anther axis is not reliable when separating B. jolonensis in Monterey County from Coastal BTK and Montane BTK in southern California. Close-up view of Coastal BTK (previously labeled B. jolonensis) from the San Marcos vernal pool area showing details of the stamen. The abaxial surface of the anther connective is grooved. The filaments are within the range of Coastal BTK and B. jolonensis. 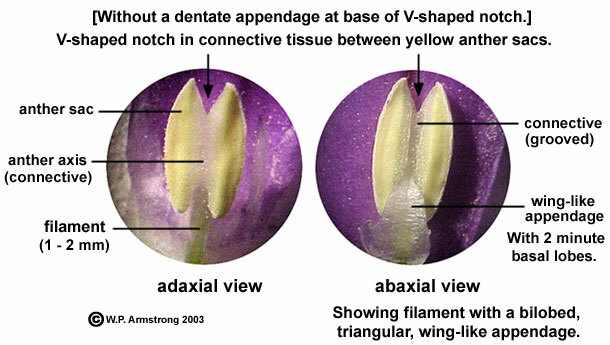 In about 50% to 70% of the flowers examined, the V-shaped apical notch in the anther connective had a minute "dentate" lobe. Close-up view of Coastal BTK (previously labeled B. jolonensis) from the San Marcos vernal pool area showing details of the staminodium and the adaxial side of the anther connective (anther axis). 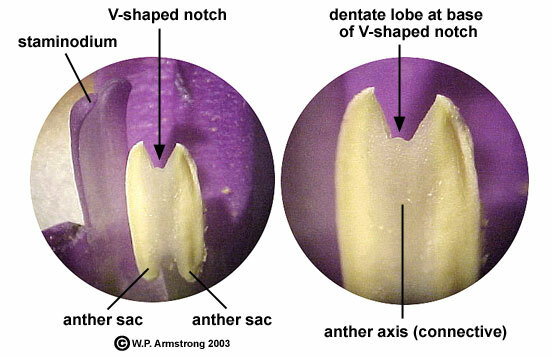 In about 30% to 50% of the flowers examined there was a minute lobe or "dentate appendage" at the base of the apical notch formed by a proliferation (elongation) of the anther connective tissue. On Otay Mesa in southern San Diego County, about 70% of the flowers examined had this minute lobe. Although it arises from the anther connective tissue, this lobe does not appear to be the true, well-defined dentate appendage characteristic of B. terrestris ssp. terrestris in central California. Close-up view of the anthers of Coastal BTK (previously labeled B. jolonensis) from the San Marcos vernal pool area showing details of the adaxial side of the anther connective (anther axis). A and B show a minute "dentate" lobe in the apical notch of the anther connective (red arrows). C has a reduced lobe and in D there is practically no visible lobe. The minute lobe at the base of the notch is formed by a proliferation (elongation) of the connective tissue. The presence of this "dentate" lobe and green ovary indicate that this species is Coastal BTK rather than B. jolonensis. Unfortunately, this "dentate" lobe does not show up in all samples of Coastal BTK. The term "dentate connective" is clearly evident in B. terrestris ssp. terrestris of central and northern California and ssp. kernensis in Kern County, but does not appear that useful in southern California populations of BTK. Stamens of earth brodiaea (Brodiaea terrestris ssp. terrestris) from Monterey. In Brodiaea terrestris ssp. 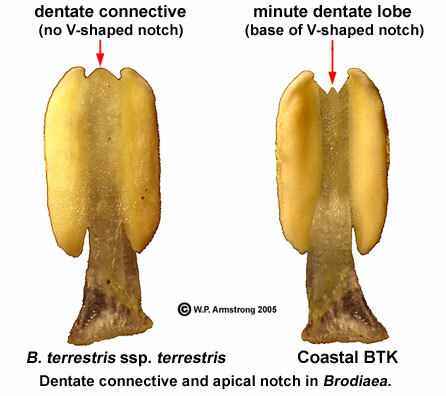 terrestris of Monterey County, the anther connective is truly dentate without the conspicuous U-shaped or V-shaped apical notch as in Coastal BTK. The connective tissue proliferates into a distinct dentate appendage or tooth. Flowers of ssp. terrestris are much smaller than ssp. kernensis, and they are produced near the ground on very short scapes only 0.5 to 7 cm tall. 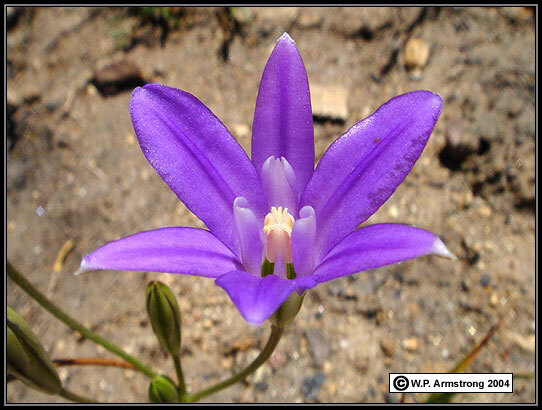 The common name "earth brodiaea" is derived from the close proximity of the flowers to the ground. The staminodes are erect or bent inward toward the stamens. In addition, the staminodes are inrolled along margins but not strongly hooded as in Coastal BTK. Earth brodiaea is a prolific producer of subterranean corms and cormlets. A dentate connective of ssp. terrestris also occurs in octoploid populations of ssp. kernensis in Kern County. BTK in Kern County showing a well-defined dentate appendage (red arrow) in the anther connective. Populations of Coastal BTK in San Diego County contain individuals with a small dentate lobe. In most southern California populations the notch in the connective is entire (without a dentate lobe). Earth brodiaea (Brodiaea terrestris ssp. terrestris) from Monterey. The flowers are much smaller than coastal and montane BTK, and grow on very short scapes near the ground. Coastal plants produce numerous cormlets and the flowers are lighter in color with more prominent inrolled staminodes. 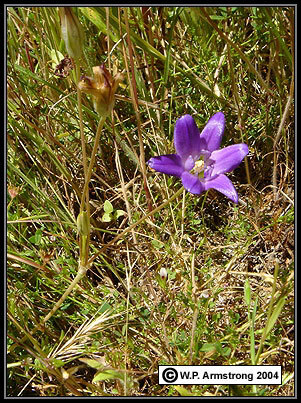 Inland earth brodiaea (B. terrestris ssp. terrestris) in the La Panza Range of San Luis Obispo County. 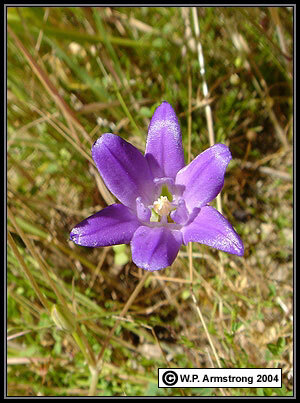 Brodiaea terrestris ssp. terrestris from San Luis Obispo County and B. jolonensis from Monterey County grown in Escondido (San Diego County). The dentate anther connective (red arrow) of BTT fits the key to species in Jepson Manual (1996). The staminodes clearly lean inward toward the stamens. The flower is a little larger than those shown in previous image from the La Panza Range. The ovary is green compared with the distinctive purple ovary of B. jolonensis (see next section). 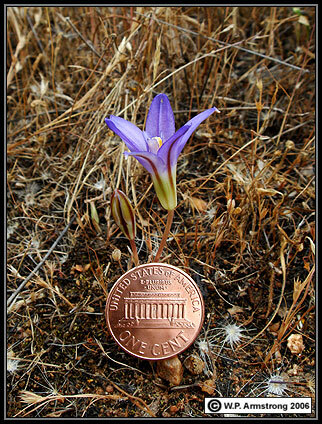 How Large Is The Penny In The Above Brodiaea Image? 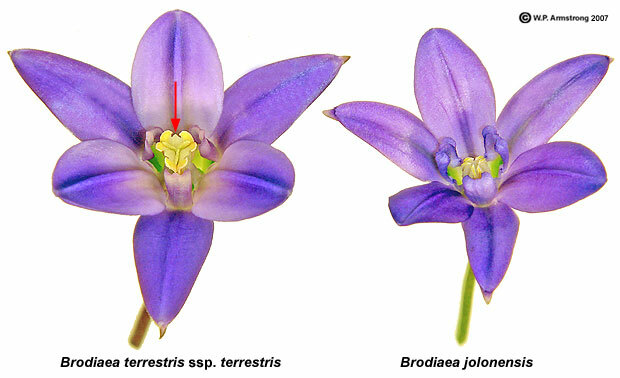 A comparison of the anther axes of Brodiaea jolonensis & B. terrestris ssp. terrestris in Monterey County, and coastal & montane "BTK" in southern California. Some Coastal BTK in San Diego County have a minute lobe at the base of the V-shaped notch. B. terrestris ssp. kernensis in Kern County also has a dentate anther axis. 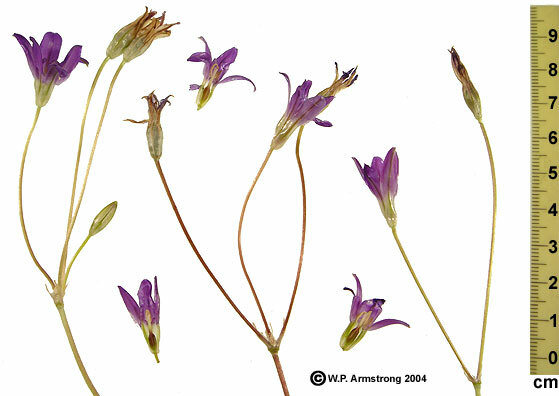 In Chris Pires' treatment of the genus Brodiaea in Flora of North America On-line, the dentate anther connective tissue is not used in the separation of Brodiaea jolonensis from B. terrestris. According to Niehaus (1971), all the Brodiaea species in California have green ovaries except B. jolonensis which has purple ovaries. This would seem like a good separation between B. jolonensis and Coastal BTK, except there may be some variation in the populations. Although most B. jolonensis observed in Monterey County had distinctly purple ovaries, a few samples had green ovaries tinged with purple. All Coastal BTK observed in San Diego County had green ovaries or green ovaries with faint purple streaks. No coastal or montane BTK had ovaries that could be described as purple as in B. jolonensis of Monterey County. An assortment of Coastal BTK flowers collected in the San Marcos Vernal Pool property on 21 April 2004. All of the ovaries are clearly green, not purple as described for B. jolonensis in the Jepson Manual of California Plants (1996). 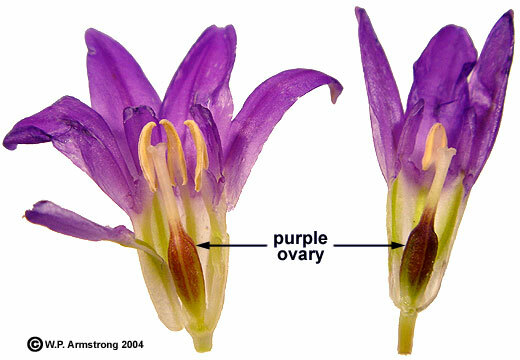 Left: Ovary of Brodiaea jolonensis grown in northern California that is unmistakably purplish. Most populations of Brodiaea in San Diego County have greenish ovaries (or with faint purple streaks) and appear to be Montane BTK or Coastal BTK. Left image courtesy of Mary Sue Ittner. Flowers of Brodiaea jolonensis from Monterey County showing the distinctive purple ovaries. 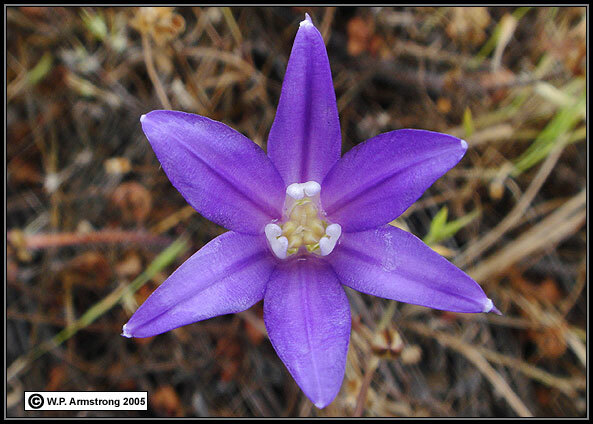 According to Niehaus (1971), this is the only species of Brodiaea in California with purple ovaries. In fact, no populations of Coastal BTK in San Diego County have ovaries this color. Flowers of Brodiaea jolonensis from Monterey County grown in Escondido (San Diego County). One staminode and one outer perianth segment has been removed. Image shows hooded staminodes and the distinctive purple ovary. 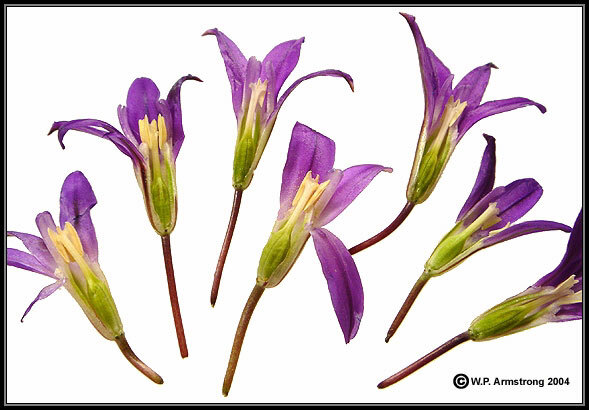 The use of purple ovary color to identify Brodiaea jolonensis ideally applies to fresh flowers. Ovaries of other species in dried herbarium specimens often turn purplish-brown. 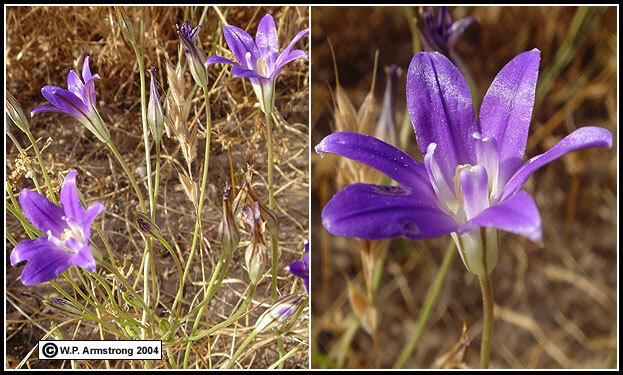 The left photo of Brodiaea ovaries was taken from herbarium specimens all collected in San Marcos. A. "Coastal BTK; B. San Marcos hybrid brodiaea or BTK variant; C. Brodiaea filifolia. The midvein of Brodiaea perianth segments contains three primary vascular bundles. Each bundle is composed of numerous vessels with spirally thickened secondary cell walls that appear like coiled springs under a compound microscope. The bundles of some species separate into strands of vessels. According to Niehaus (1971), the number of strands is characteristic of certain species. In BTK, vascular bundles of inner perianth segments separate into multiple strands, up to three strands per bundle. Bundles of B. jolonensis typically contain fewer strands than BTK. Because of overlapping vascular strands and the limited depth of field with compound light microscopes, it is often difficult to capture the well-defined strands of all three vascular bundles in a single image. Strands are not always separated from each other along a vein, and appear to merge in places. In damaged or poorly dried (wrinkled) perianth segments, strands may be broken. Individual vessels may have separated from the strands or be out of focus. In general, B. jolonensis has fewer well-defined strands compared with Coastal BTK in southern California. According to Niehaus (1971), the vascular pattern of perianth segments may be used to differentiate between species of Brodiaea. This is especially useful in B. terrestris kernensis (Coastal BTK) and B. jolonensis because the vascular strand patterns of inner perianth segments are different is these two species. Inner perianth segments from dried herbarium specimens of B. jolonensis (Monterey County) and Coastal BTK (San Marcos). The veins of both segments are composed of three vascular bundles. According to Niehaus (1971) bundles of B. jolonensis consist of single strands of tracheary elements (vessels), while those of B. terrestris kernensis consist of triple strands of tracheary elements. The primary vascular bundles are visible macroscopically (10x). Strands of intertwined vessels are visible with a compound microscope at 100x magnification. Perianth segments and primary vascular bundles of Coastal BTK are larger than those of B. jolonensis. Left: Magnified view (100x) of an inner perianth segment of Coastal BTK from San Marcos showing three primary vascular bundles (outlined in black). Each bundle is composed of three strands of tracheary elements (vessels), a total of nine strands. The strands consist of several intertwined vessels. Niehaus (1971) represented this strand pattern as 3-3-3. Right: Magnified view (100x) of an inner perianth segment of B. jolonensis from Monterey County showing three primary vascular bundles. Each bundle consists of a single strand of tracheary elements, a total of three strands. Niehaus (1971) represented this strand pattern as 1-1-1. Unfortunately, this 1-1-1 pattern does not appear to be consistent in samples of B. jolonensis that I have examined from Monterey County. B. jolonensis may also have four or more vascular strands of intertwined tracheary elements depending on what part of the segment is viewed. The bottom line here is that B. jolonensis has fewer strands than Coastal BTK. The perianth segments were cleared by soaking them in NaOH and stained with safranin. Inner perianth segments are readily identified because they have an attached anther at the base. Outer perianth segments have attached staminodes and a 1-2-1 vascular pattern in both BTK and B. jolonensis. In his monograph on Brodiaea Niehaus subdivided the three primary vascular bundles into multiple strand patterns. I assume a strand is one or more vessels with spirally thickened secondary cell walls. Although Niehaus (1971) described three vascular strands in the inner perianth segment for Brodiaea jolonensis, I have observed three, four or more strands. Depending on the precise location along the perianth segment, a given primary bundle may separate into two or more strands. I have never seen Brodiaea jolonensis with nine strands as I have observed in Coastal BTK. 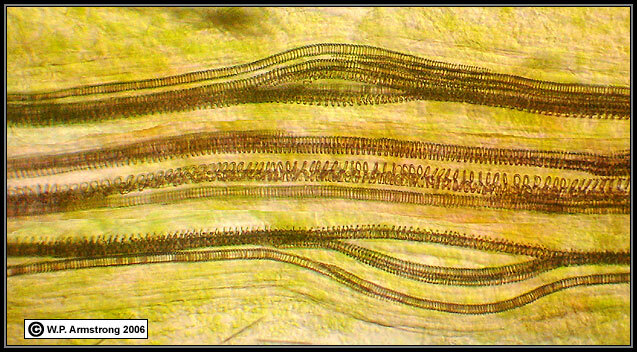 Microscopic view of the inner perianth segment of Brodiaea jolonensis from Monterey County. There are four distinct vascular strands, each composed of one or more vessels. Coastal BTK typically has more vascular strands. (Magnification 400 x). The following image of an inner perianth segment shows Coastal BTK above Gaviota Pass, Santa Barbara County, with at least nine vascular strands. There is no way that I can describe this pattern as having three or four vascular strands as in B. jolonensis. Its strand pattern is consistent with other populations of Coastal BTK in southern California, including Santa Catalina and San Miguel Islands. Brodiaea jolonensis appears to be endemic to the Coast Ranges of central California, primarily in Monterey County, and does not occur in southern California. Microscopic view of the inner perianth segment of a Coastal BTK flower from above Gaviota Pass, Santa Barbara County. There are three primary vascular bundles each containing three vascular strands. Each strand is composed of vessels with spirally thickened secondary cell walls. This is an exceptional view because it is usually difficult to show all three strands of each primary bundle in a single image. Under the microscope, it is often necessary to move along the midrib of the perianth segment to see where each primary bundle separates into multiple strands. In dried herbarium specimens, the strands often become broken or distorted, especially if the segment is wrinkled or creased. In Brodiaea jolonensis there are typically only three or four vascular strands. It would be difficult to describe this image as having only three or four strands. Perianth segment cleared in 10% NaOH and stained with safranin. (Magnification 200 x). 1. Measured from attachment point at pedicel to tip of perianth segment. 2. Flower length of Coastal BTK has range of 17-30 mm. 3. Top of connective tissue extends into a pointed tooth resembling an inverted-V. This is well developed in Kern County BTK and Brodiaea terrestris terrestris in San Luis Obispo and Monterey Counties. 4. Top of connective has an indentation or notch resembling a V or a U. 5. Notch in top of connective contains a pointed toothlike lobe resembling the center of a W.
6. This is a narrow ridge of inner perianth tissue between the bases of adjacent staminodes and filaments. When viewed from above, it appears to fuse the bases of staminodes and filaments into a connate ring of tissue. In some species this ridge may be at least one mm in thickness. In others, it is less than 0.5 mm and barely discernable or lacking. It is barely discernable in some populations of Kern County BTK and southern California Montane BTK, but is conspicuous in Coastal BTK of southern California and Brodiara jolonensis of central California. 7. There is a very narrow connate ridge (less than 0.5 mm) or no ridge in Kern County BTK and montane BTK in southern California. 8. Montane BTK in southern California often has inrolled staminodes instead of hooded staminodes; however, corms from the Laguna Mts. grown in Escondido produced flowers with hooded staminodes like those typical of coastal BTK. 9. Chromosome numbers need further study. Niehaus' numbers of 36 for BJ in San Diego and Santa Barbara Counties obviously refer to Coastal BTK. My count for Coastal BTK in San Marcos is at least 36. Preliminary studies by Dale McNeal indicate that the number for coastal BTK may be greater than 40. There are other characteristics not listed in the above table. Some of these are quite variable and might be correlated with annual rainfall or other factors. In general, BJ has consistently the longest scapes of all brodiaea populations observed (up to 29 cm). BTT has the consistently shortest scapes, often only 2-6 cm long. Inland BTT in the La Panza Range resemble a diminutive version of Kern County BTK, except the staminodes are more strongly bent inward. Ovaries of BJ in Monterey County are consistently purple, a trait that is shared by no other species. Some Coastal and Montane BTK in southern California have green ovaries with faint streaks of purple, but these could hardly be called purple. Left: The outer bract subtending the inflorescence of B. jolonensis from Monterey County has 10 nerves depending on where they are counted. Right: The outer bract of Coastal BTK from San Marcos has 6-7 nerves. According to Niehaus (1971) these numbers can be used for diagnostic purposes. Coastal BTK generally has 5-8 nerves compared with 9-10 for B. jolonensis. Outer bract subtending the inflorescence of Coastal BTK from San Marcos. There are 7 prominent nerves, 8 if you count the small nerve on the left side of image. Coastal BTK generally has 5-8 nerves compared with 9-10 for B. jolonensis. According to Rob Preston (personal communication, 2006), in some Brodiaea species the inner perianth extends into a narrow, continuous ridge of tissue that is fused with the bases of staminodes and adjacent filaments. When viewed from above, It forms a ring of tissue (ridge) at the bases of the perianth segments that varies in width depending on the species. In B. jolonensis the ridge is at least 2 mm wide. In B. terrestris, there is only a slight degree of connation between the staminodes and filaments, sometimes a continuous ridge only 0.5 mm wide, or sometimes just a flap of tissue between the staminodes and filaments. This ridge of extended tissue is barely discernable in some populations of Kern County BTK and southern California Montane BTK , but is fairly conspicuous in Coastal BTK of southern California. 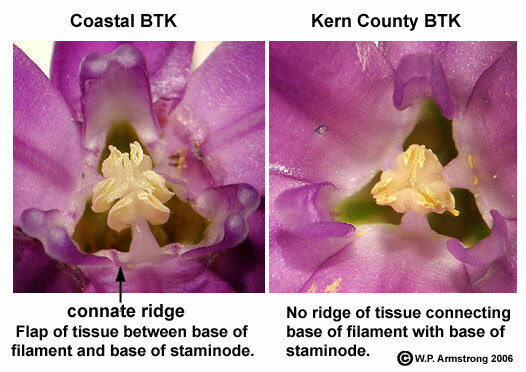 Notice that staminode of Coastal BTK is hooded, while the staminode of Kern County BTK is inrolled along the upper margin but not hooded. In order to verify the characteristics of Brodiaea jolonensis, I went to Monterey County, California. The trail to Junipero Serra Peak (northwest of Jolon) passes through a meadow of grassland, bordered by a marshy creek. During the hot month of early June 2004, the brodiaeas were still in bloom among the grasses and sedges near the creek. The flowers were noticeably smaller than Coastal BTK in San Diego County. The maximum length of B. jolonensis from the base of flower (at junction with pedicel) to the tip of the perianth lobe was about 2.0 cm, compared with 2.5 cm for Coastal BTK in San Diego County. Apparently the polyploid chromosome numbers of Coastal BTK and Montane BTK are reflected in the larger flower size of these populations. Scapes of B. jolonensis were 7-30 cm tall, with an average height of 16 cm. Pedicels were 2-9 cm, with an average length of 4.8 cm. The average filament length was about one mm, shorter than Coastal BTK. The anthers appeared connivent (clustered together but not organically united), unlike the separate anthers of Coastal BTK observed in coastal San Diego County. In addition, the anther tips of many flowers were incurved, obscuring the V-shaped notch in the connective tissue. Characteristics of B. jolonensis along Junipero Serra trail are summarized in Table 1. With the exception of pedicel length, the dimensions for B. jolonensis along Junipero Serra trail were similar to the comparison chart for B. jolonensis vs. Coastal BTK in Table 2. Table 1. Characteristics of Brodiaea jolonensis on Junipero Serra Trail. The ovaries of B. jolonensis along Junipero Serra trail were distinctly purple, unlike the green ovaries of Coastal BTK in San Diego County. In addition, the V-shaped notch in the anther connective was entire (without a minute appendage or lobe), unlike many of the Coastal BTK examined in San Diego County. The B. jolonensis observed in Monterey County are obviously different from populations of Coastal BTK observed in San Marcos, Kearny Mesa and Otay Mesa in San Diego County. 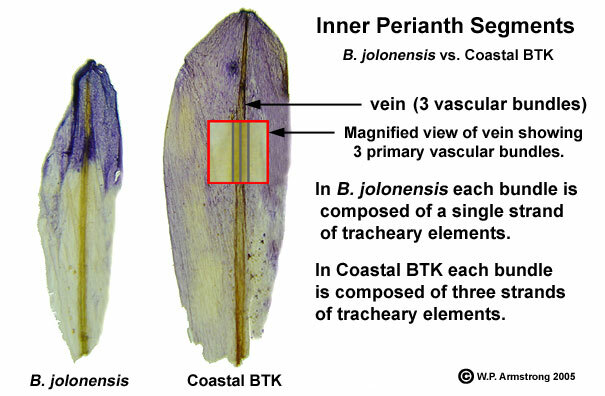 In conclusion, compared with Coastal BTK and Montane BTK, the scapes of B. jolonensis are taller, the flower dimensions are smaller, the ovaries are distinctively purple rather than green, and the V-shaped anther connectives are entire without minute lobes. The specific epithet "jolonensis" commemorates the extinct town of Jolon (ho-LONE) in southern Monterey County. [The correct pronunciation of jolonensis is ho-lo-nen-sis.] All that remains of Jolon today are the crumbling adobe walls of the old Dutton Hotel. In 1876, Jolon was a thriving town serving the Los Burros Gold Mines, surrounding ranches, and weary highway travelers. With the completion of the Southern Pacific railroad connecting King City with Paso Robles in the late 1800s, travelers began following a different route. The famous Dutton Hotel eventually went out of business and the town of Jolon became extinct. 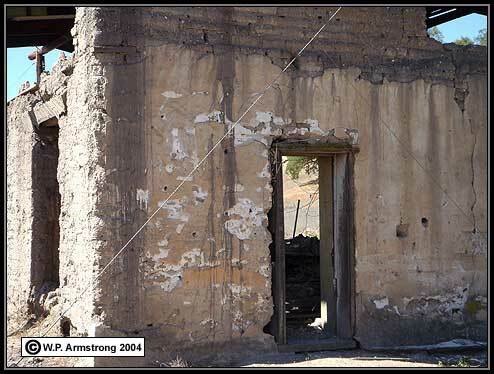 Although it is still shown on most maps of Monterey County, the crumbling adobe walls of the old Dutton Hotel is all that remains of the town of Jolon. The specific epithet of Brodiaea jolonensis is derived from this historic town. Brodiaea jolonensis in Monterey County, California. Photograph taken near marshy creek along trail to Junipero Serra Peak in early June, 2004. The ovaries of these flowers were purple, unlike the green ovaries of Coastal BTK in San Diego County. In addition, the flowers were slightly smaller than Coastal BTK. Brodiaea jolonensis in Monterey County, California. Photograph taken near marshy creek along trail to Junipero Serra Peak in early June, 2004. 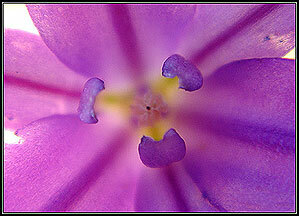 The ovary of this flower was purple, unlike the green ovaries of Coastal BTK in San Diego County. The apex of each staminode is slightly curved inwardly (hooded). 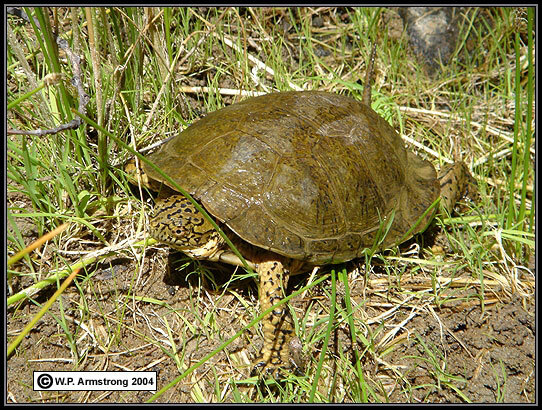 A western pond turtle (Clemmys marmorata) basking in the sun along a marshy creek near the trail to Junipero Serra Peak. This is ample proof of the moist conditions where Brodiaea jolonensis was in bloom during the late spring of June 2004. It is doubtful that the smaller flower size compared with Coastal BTK is related to lack of water. Brodiaea jolonensis in Monterey County showing three anthers (an) subtended by three staminodia (st). A V-shaped notch is visible in one of the anther connectives. V-shaped notches in the other two anther connectives are not visible in this image. The anthers appear more bunched together (connivent) than observed populations of Coastal BTK in San Diego County. In addition, the anther tips are incurved, obscuring the V-shaped notch. Abaxial view of two stamens of Brodiaea jolonensis from Monterey County. 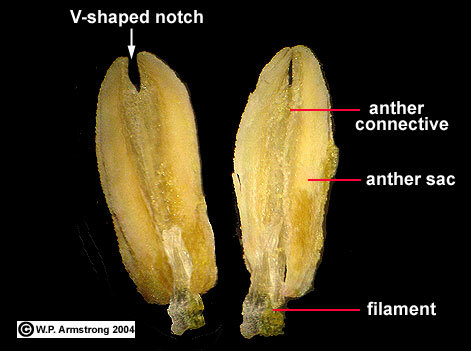 A V-shaped notch is visible in the anther connective of the left stamen. No dentate appendages or lobes were observed on any flowers from this site. In many flowers, anther apices were incurved and connivent, obscuring the V-shaped notch. The average length of all filaments observed was one mm. Grassy meadow along trail to Junipero Serra Peak in Monterey County, California. The Brodiaea jolonensis in above photos were photographed in the moist, dark green marshy area along creek. Inflorescences of Brodiaea jolonensis from Monterey County showing the scapes and pedicels. The average scape length of all flowers examined was 16 cm. Pedicels ranged from 2-9 cm, with an average length of 4.8 cm. Compared with Coastal BTK, B. jolonensis has shorter stamen filaments and smaller flowers with distinctive purple ovaries. See Table 2 below. Herbarium specimens of Coastal BTK from San Marcos (left) and B. jolonensis from Monterey County (right). The flowers of Coastal BTK (6n = 36) are approximatey 2.5 cm long, from base of flower (junction with pedicel) to tip of perianth lobe. [Fresh flowers of Montane BTK from the Laguna Mountains in San Diego County measured 3 - 3.5 cm in length.] Flowers of B. jolonensis are approximately 2.0 cm long, from base of flower to tip of perianth lobe. The larger dimensions for polyploid flowers of Montane BTK are summarized below in Table 2. Populations of B. terrestris ssp. kernensis in Kern and Tulare Counties have octoploid sprophyte numbers of 48. The chromosome number of Montane BTK in San Diego County is unknown at this time. Coastal BTK photographed in a dry grassland area of Otay Mesa in southern San Diego County (May 13, 2004). 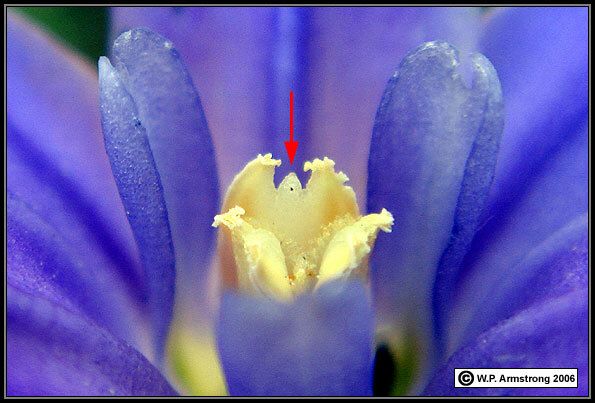 About 70% of the flowers examined had a minute appendage (lobe) at the base of the apical notch in the anther connective. Many flowers contained small beetles that appeared to be feeding on the anthers and connective tissue. All of the flowers had green ovaries; none had purple ovaries typical of B. jolonensis. The apex of each staminode was curved inwardly (hooded). Floral dimensions, including length of scape, pedicels, floral tube, filaments, and perianth segments were typical of Coastal BTK. Coastal BTK from Otay Mesa. The anthers are separated from each other, not curved inwardly (connivent) as in B. jolonensis from Monterey County. The apical notch in connective tissue is easily observed in mature flowers. The average filament length is 2-3 mm compared with shorter filaments of B. jolonensis which average about one mm in length. Coastal BTK photographed in a dry grassland area of Otay Mesa in southern San Diego County (May 13, 2004). Floral characteristics, including ovary color, dentate appendage in anther connective, length of scape, pedicels, floral tube, filaments, and perianth segments were typical of Coastal BTK. 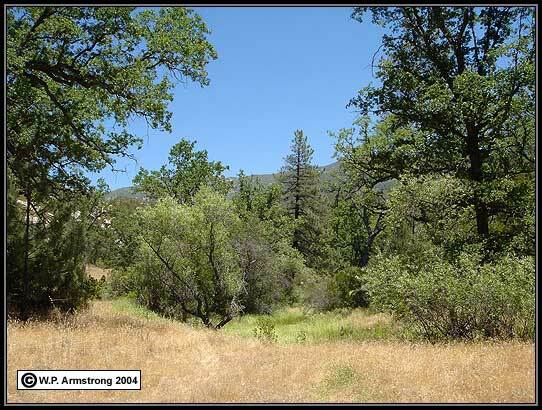 During June 2004, a population of Montane BTK was in full bloom in a burned meadow along Sunrise Highway in the Laguna Mountains of San Diego County. The peduncles ranged from 3 - 10 cm, with an average length of 6 cm. 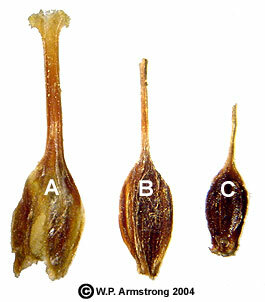 Pedicels of mature flowers were 4 - 7 cm, with an average length of 6.2 cm. Stamen filaments were 2 -3 mm, with an average length of 2.5 mm. 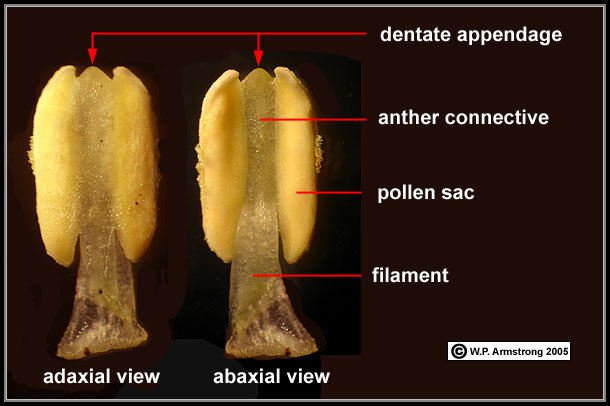 In most of the flowers examined, there was no proliferation of the anther connective tissue into a dentate appendage within the apical notch. All of the ovaries were light green without a trace of purple. The flowers were 3 - 3.5 cm long, from base of flower to tip of perianth lobe. Most of the flowers were at least one cm longer than B. jolonensis in Monterey County. The staminodes were erect and inrolled along margins. They did not have the characteristic hooded apex of populations of Coastal BTK in San Diego County. Montane BTK in the Laguna Mountains of San Diego County, California. Photographs taken along Sunrise Highway (S-1) in early June, 2004. In general, the peduncles were much shorter than B. jolonensis in Monterey County. The ovaries were light green, unlike the purple ovaries of B. jolonensis. In addition, the flowers were larger than B. jolonensis and the floral tubes were slightly more funnel-shaped than bell-shaped. Montane BTK in the Laguna Mountains of San Diego County, California. Photograph taken along Sunrise Highway (S-1) in early June, 2004. The ovary was light green, unlike the purple ovaries of B. jolonensis. The staminodes were inrolled along their margins. They were not hooded, as in populations of Coastal BTK in San Diego County. In addition, the flower was larger than B. jolonensis and Coastal BTK. BTK from the Laguna Mountains grown in Escondido from a corm (June 2006). The staminodes are more conspicuously hooded compared with the wild population along Sunrise Highway (S-2) where the corm was collected. 3. Top of connective tissue extends into a pointed tooth resembling an inverted-V.
7. 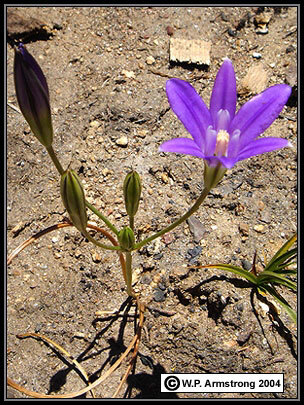 Brodiaea jolonensis appears to be endemic to the Coast Ranges of central California (primarily Monterey County). Reports of BJ in southern California (Santa Barbara to the Mexican border) appear to be Coastal BTK. Reports of BJ on Santa Catalina and San Miguel Island are also Coastal BTK. The taxonomic status of Coastal BTK is enigmatic because it tends to intergrade with Montane BTK on the Santa Rosa Plateau of Riverside County. 8. There are other characteristics not listed in the above table. Some of these are quite variable and might be correlated with annual rainfall or other factors. In general, BJ has consistently the longest scapes of all brodiaea populations observed (up to 29 cm). BTT has the consistently shortest scapes, often only 2-6 cm long. Inland BTT in the La Panza Range resemble a diminutive version of Kern County BTK, except the staminodes are more strongly bent inward. Ovaries of BJ in Monterey County are consistently purple, a trait that is shared by no other species. Some Coastal and Montane BTK in southern California have green ovaries with faint streaks of purple, but these could hardly be called purple. Chromosome numbers need further study. Niehaus' numbers of 36 for BJ in southern California obviously refer to Coastal BTK. 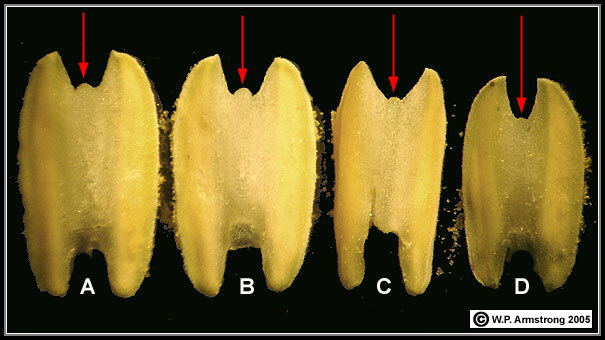 It is interesting to note that in Chis Pires' treatment of the genus Brodiaea in Flora of North America On-line, the dentate anther connective tissue is not used in the separation of Brodiaea jolonensis from B. terrestris. Scape lengths at the extreme ends of the scale would fit B. terrestris; however, the scape length for B. jolonensis is completely within the range of B. terrestris. Although there are overlapping dimensions, when applied to the population of Brodiaea in San Marcos (previously labeled B. jolonensis), the characteristics in Table 2 fit Coastal BTK better than B. jolonensis. This is true even if the term "dentate" anther connective is not used. Some populations of Brodiaea jolonensis previously cited for San Marcos, Kearny Mesa and Otay Mesa in coastal San Diego County appear to be misidentified. According to T. F. Niehaus (personal communication, 2004), hybrids are encountered where the distribution of two Brodiaea species overlap. The hybrids show a range of intermediate characteristics between the parents. Under controlled greenhouse conditions, Niehaus was able to hybridize every combination between all species and obtain seed. In a few crosses a relatively high percentage of seed set was obtained, although seed set was low in most interspecific crosses. He was able to grow the hybrid seeds to flowering in 2-3 years. 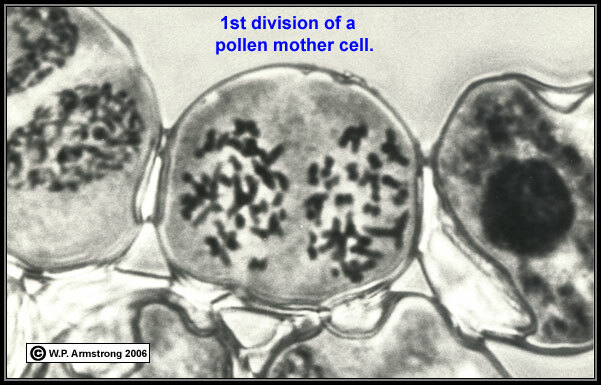 According to Niehaus (1971), the majority of hybrids had sterile pollen. Although pollen viability is a good indicator of hybridization in brodiaeas, there may be other factors causing hybrid sterility. Hybrid clones can be propagated by cormlets. Throughout the range of Coastal BTK and Montane BTK in southern California, small clonal populations can be found with intermediate or aberrant staminodia. I observed a small population of a variant B. elegans at Mission Trails Regional Park. The flowers appeared to be intermediate between nearby B. elegans ssp. elegans and Coastal BTK; however they had 65% pollen viability which is not typical of a true interspecific brodiaea hybrid. Another small population of Montane BTK at Cuyamaca Lake had staminodes bearing anthers at the tips. Small populations with the same aberrant staminodes may be clones of each other that developed asexually through cormlets. In San Marcos, I have observed a brodiaea variant with intermediate characteristics between two possible parental species, Coastal BTK and B. filifolia. [A third species (B. orcuttii) also grows nearby within the vernal pools.] One of the most obvious characteristics that indicate hybridization is a structure called a staminodium that represents a sterile, nonfunctional stamen. The staminodes of the possible hybrid are intermediate between the conspicuous, petaloid staminodes of Coastal BTK and the slender (filiform), inconspicuous staminodes of B. filifolia. The variant staminodes appear strap-shaped, unlike the hooded (incurved) staminodes of typical Coastal BTK. One major caveat to the hybrid hypothesis is that I have also seen considerable variation in other brodiaea populations. On the Santa Rosa Plateau of Riverside County, populations of BTK exhibit a wide range of variation, including strap-shaped staminodes similar to the San Marcos "hybrid." Could it be that the San Marcos "hybrid" brodiaea is simply a variation within the BTK population? The San Marcos variant appeared to be a clonal population because it occurred in a one acre area at the southwest end of the property, and probably reproduced asexually through cormlets. In May 2005, I visited this same site but did not observe any of the variants. Instead I found numerous B. filifolia, B. orcuttii and Coastal BTK. The previous winter and spring was an exceptional year for rainfall in San Diego County and brodiaea populations were plentiful. In May 2006, I found variants with strap-shaped staminodes at the northeast end of the property. The flowers were completely sterile with no pollen inside the anthers, indicative of sterile hybrids. Unfortunately, the fate of these rare brodiaea populations is dismal because of the rapid (uncontrolled) urbanization of northern San Diego County. In this case, the rare brodiaeas just happen to be living in a 40 acre field surrounded by buildings and zoned for industry. According to Niehaus (1971), most Brodiaea species have a base number of 6 chromosomes per haploid set, while B. elegans, B. insignis and B. kinkiensis have base numbers of 8. The gametophyte number is the number of chromosomes per gamete and the sporophyte number is the number of chromosomes per adult plant cell. Brodiaea jolonensis in Monterey County has a gametophyte number of 6 and a diploid (2n) sporophyte number of 12. Niehaus (1971) also reported a B. jolonensis on Otay Mesa with a gametophyte number of 18 and a hexaploid (6n) sporophyte number of 36. The latter species appears to be Coastal BTK observed throughout San Diego County. According to Niehaus (1971), B. terrestris ssp. kernensis from Kern County has a gametophyte number of 24 (4 sets of 6 chromosomes) and a sporophyte number of 48 (octoploid). Brodiaea filifolia and B. orcuttii both have gametophyte numbers of 12 (2 sets of 6 chromosomes) and sporophyte numbers of 24 (tetraploid). Summarized from: "Advances in the Study of Polyploidy Since Plant Speciation." by D.E. Soltis, P.S. Soltis, and J.A. Tate. New Phytologist 161: 173-191 (2003). Old genomes that are polyploid with respect to the base number and amount of genetic material, may function as diploids with respect to the level of gene expression and chromosomal characteristics. These "old polyploids" may have become "diploidized" by the loss, mutation or suppression of duplicate genes. Other causes for diploidization may include genomic rearrangements and transposons. This can drastically change the chromosome properties of a species. For example, an odd polyploid with a base number of six might have a sporophyte number of 5n = 30. This pentaploid would tend to be sterile because of an odd chromosome set at synapsis of prophase I. However, if this plant behaves as a diploid with 2n = 30, it would be fertile with two sets of 15 chromosomes during meiosis. It would simply have a diploid (sporophyte) number of 2n = 30 and a haploid (gametophyte) number of n = 15. According to Niehaus (1971), the lack of quadrivalents in meiosis plus the differences in size of individual mitotic chromosomes at different ploidy levels suggests that these are "old polyploids." That is, the tetraploids, hexaploids, and octoploids have been in existence long enough to change by translocations, deletions, and so on. These differences apparently are enough to ensure that during meiosis only bivalents will occur in the higher ploidy levels. In bivalents, only two sets of maternal and paternal chromosomes associate during synapsis of meiosis, in contrast to quadrivalents where four sets of homologous chromosomes associate during meiosis. If Brodiaea species behave as diploids, then BF and BO each have n = 12 and 2n = 24, and BTK has n = 18 or a higher number. In fact, BTK could be 2n = 36, 38, 40, 42, 44, 46, 48, etc. and still be theoretically fertile with two sets of homologous chromosomes. A hybrid between BF or BO and BTK would be sterile because of the non-homologous pairs of chromosomes that differ in number. Hybridization may occur, but the resulting hybrid offspring grown from seed may by sterile without viable pollen. For example, a cross between BF and BTK could result in a hybrid with 12 BF chromosomes and 18 BTK chromosomes which would not match up during synapsis of prophase I. This hypothesis explains the sterile hybrids we have observed in San Marcos. 14. Conclusion: Does B. jolonensis Occur In Southern California? 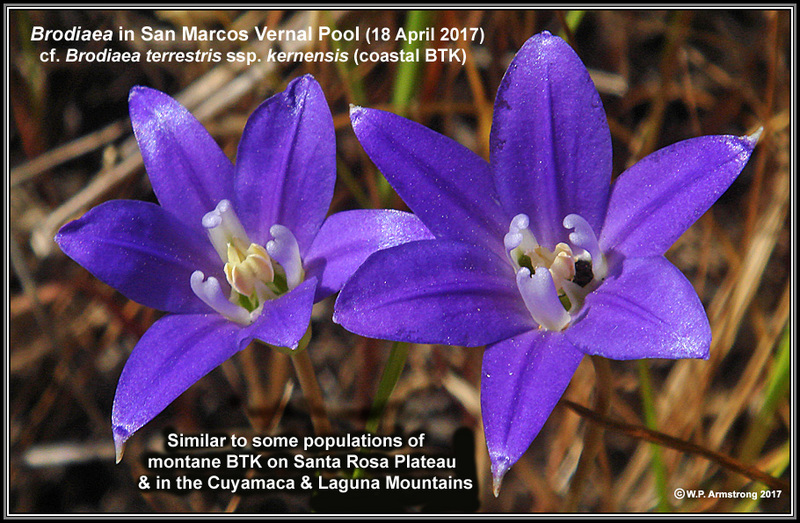 Information and images presented on this page, and quantitative data and graphs compiled by Tom Chester, indicate that brodiaea populations from San Marcos, Kearny Mesa, Mission Trails and Otay Mesa in San Diego County are Coastal BTK rather than B. jolonensis. Populations from the Santa Monica Mountains and Santa Catalina Island (Los Angeles County) and the Santa Rosa Plateau (Riverside County) also appear to be Coastal BTK. In May 2006 I examed a population above Gaviota Pass in Santa Barbara County and it appears to be Coastal BTK and not B. jolonensis. In "A Biosytematic Study of the Genus Brodiaea," Univ. of Calif. Publications in Botany Vol. 60 (1971), T.F. Niehaus cites a collection of B. jolonensis (# 662) from Otay Mesa. Is this the same Coastal BTK that Tom and I have observed throughout coastal San Diego County? As of June 2005, we have been unable to locate any brodiaeas at this site, probably because of the extirpation of Niehaus' original collection site. Unfortunately, herbarium specimens do not show some of the detailed floral characteristics that distinguish B. jolonensis from Coastal BTK. 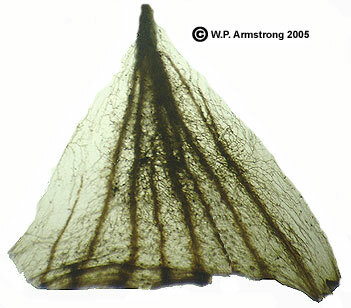 In July 2005, I examined the vascular pattern of an inner perianth segment from #662. It had 3 strands of tracheary elements per bundle, a total of nine strands. This is typical of coastal BTK populations in San Diego County. [B. jolonensis has a total of only three or four strands.] Niehaus published a sporophyte chromosome number of 36 for this specimen, compared with 12 for B. jolonensis in Monterey County and 48 for B. terrestris ssp. kernensis in Kern County. It seems likely that Niehaus' #662 may in fact be "Coastal BTK" which has been confused with B. jolonensis in southern California for decades. Niehaus also determined a chromosome number of 36 for a sample from Santa Barbara County, different from the number of 12 determined from plants in Monterey County. As of May 2006, we have determined that the plants at Gaviota Pass are Coastal BTK and not B. jolonensis. It is also possible that Montane BTK in southern California has the same chromosome number as Coastal BTK. No one has ever determined a chromosome number for any putative BTK populations except for plants in Tulare and Kern counties. Clearly, more chromosome studies and observations are needed to determine the relationship of Coastal BTK, Montane BTK, and the populations of B. terrestris ssp. kernensis in Kern County. We are currently collaborating with Dale McNeal of University of the Pacific to get chromosome counts of a larger sample of the southern California plants.